Kerry Packer. 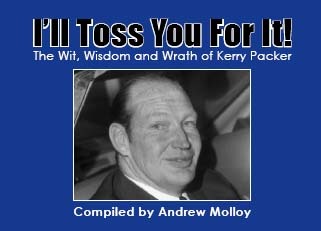 Directory of Stories and Articles about Kerry Packer. Anxious to read the latest Kerry Packer book? Ray Martin: Is it true you would give anything to play sport for Australia? “The ultimate purgatory for me would be to go to the Opera House and hear Joan Sutherland sing.” Kerry Packer. An Alan Bond only happens to you once. After Mr Bond bought the Channel Nine network for $1.05 billion in 1987. Packer bought it back three years later for little more than $200 million. Interesting Stories and Articles about Kerry Packer. Kerry Packer article at Wikipedia - Excellent biography of Kerry Packer outlining the important dates and turning points in his business career. Walking with giants - 25 June 2007 - The Bulletin - article on old style media bosses. Packer explodes Alan Bond myth - 27 October 2006 - Crikey. James Packer cleared up an urban myth at the 2006 PBL Limited AGM. Kerry Packer State Memorial - 28 February 2006 - The Bulletin review of Kerry Packer's Memorial Service. Movie about Casino Mogul Kerry Packer in Production - 12 February 2006 - interesting story about a proposed movie called "Chasing the Whale" about the high rolling Kerry Packer. The Speculator and Packer 17 January 2006 - The Bulletin David Haselhurst recalls Kerry Packer's interest in the Speculator column. Not the News 17 January 2006 - The Bulletin humurous article by Patrick Cook. How Packer lavished his property on a friend - 7 January 2006 - Sydney Morning Herald. Norman remembers Kerry Packer 30 December 2005 - Sydney Morning Herald. Greg Norman pays tribute to Kerry Packer. A matchless style - 28 December 2005 - Sydney Morning Herald nice article by Paul Barry. Apprentice becomes master after years in the waiting - 28 December 2005 - Sydney Morning Herald - James Chessell. Like father, like son … he learnt his lessons well - 28 December 2005 - Sydney Morning Herald - Valerie Lawson. How he clinched a deal in his dying days - 28 December 2005 - Sydney Morning Herald - Roy Masters. Man with his finger on the TV remote - 28 December 2005 - Sydney Morning Herald - Stephen Gibbs. A fearless punter until the very end - 28 December 2005 - Sydney Morning Herald - Matt O'Sullivan and James Chessell. Praise for passionate Australian - 28 December 2005 - Sydney Morning Herald - Andrew Clark and Mark Metherell . Death of a giant - 28 December 2005 - Sydney Morning Herald - Jeni Porter, Valerie Lawson, Roy Masters and James Chessell. PBL primed for changing of the guard - 28 December 2005 - Sydney Morning Herald - Lisa Murray. Plagued by heart, kidney ailments for years - 28 December 2005 - Sydney Morning Herald - Valerie Lawson. A fine ear for innovation, a sure eye for political leverage - 28 December 2005 - Sydney Morning Herald - Anne Davies. Betting man's advice: never risk the lot - 28 December 2005 - Sydney Morning Herald - Kate McClymot. Packer's life and times - 27 December 2005 - The Age. Excellent series of pictures showing Kerry Packer's life in images. Best of Friends - 29 November 2001 - Transcript of ABC TV Australian Story. Nice reading about the friendship between Kerry Packer and his mate Nick Ross. Clyde Packer 1935-2001 - 11 April 2001 - The Bulletin death of Kerry Packer's brother Clyde Packer. Packer's loss is our gain - 30 September 2000. Article defending Kerry Packer's right to lose $34 million at a Las Vegas casino, after attacks made by then Federal Leader of the Opposition, Mark Latham. Kerry Packer 1937-2005 - Friday 30 December 2005. Greg Norman remembers - excellent anecdotes from golfer Greg Norman. Power Plays - Laurie Oakes. © 2007, Australian Media Pty Ltd. ABN 98 091 747 723.